When you think of pesto do you think of basil? Most of us do. 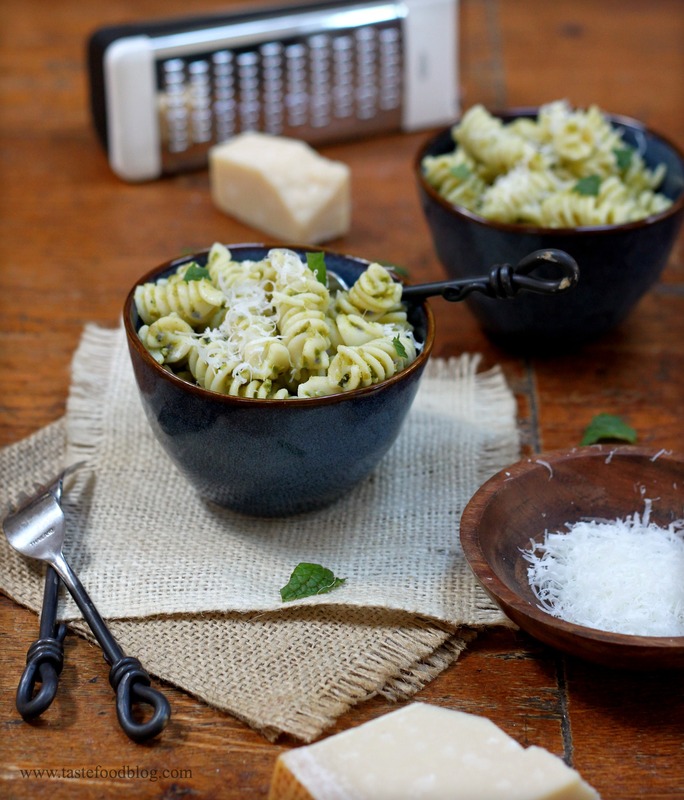 Traditional Pesto Genovese, the ubiquitous garlicky basil puree tossed with pasta is an Italian staple. I have to admit, though, that basil is not my favorite herb. When I use it, I do it sparingly so it’s pungent flavor doesn’t overwhelm. So, when I do make a pesto I like to substitute some or all of the basil with other herbs and greens – and you should too, even if you love basil. Herb pestos are a great way to use copious greens, and a wonderful way to spread their flavor in pastas, dolloped over pizzas or smeared on crostini. They are also great as a garnish or sauce for grilled meats, chicken, and fish. Try substituting parsley, cilantro, mint – or a mixture of all of them. Greens such as arugula and baby spinach also work well. I made this pesto with fresh baby spinach leaves and added a little lemon and mint to brighten the mix. Makes about 1 1/2 cups pesto. Place the spinach, garlic, mint, cheese, almonds and lemon zest in the bowl of a food processor. Pulse until coarsely chopped. With the motor running, add the oil in a steady stream to blend. If too thick add a little more oil to desired consistency. Transfer to a bowl. Season with salt and black pepper. To serve with pasta, bring a large pot of salted water to a rolling boil. Add 1 pound pasta, such as fusilli, and cook until al dente. Drain. Toss with several heaping spoonfuls of pesto to coat. Serve with additional grated cheese. Serves 4. I completely agree with you on this… I find the traditional Pesto Genovese to be overpowering, and almost never make it as such. To me, either mixing other herbs or greens/herbs is the way to go…. This looks fabulous! While I love the traditional Pesto Genovese… I’m totally open to trying new things, and these ingredients are so nice. I love the combination of spinach, mint, lemons and almonds… I’ll definitely be trying this. I’m loving your forks! I saw them on another person’s blog, and I’m not kidding when I say that I was just online searching for them!! Lol.. They’re so pretty…so perfect for a summer’s table. I like to make it with arugula instead of the mint and spinach. Notice you substituted almonds for the pine nuts – try pistachios as well. And some chile flakes can be just the thing. I also like to use pestos of all kinds to top grilled meats, chicken or fish like a pat of butter to finish. 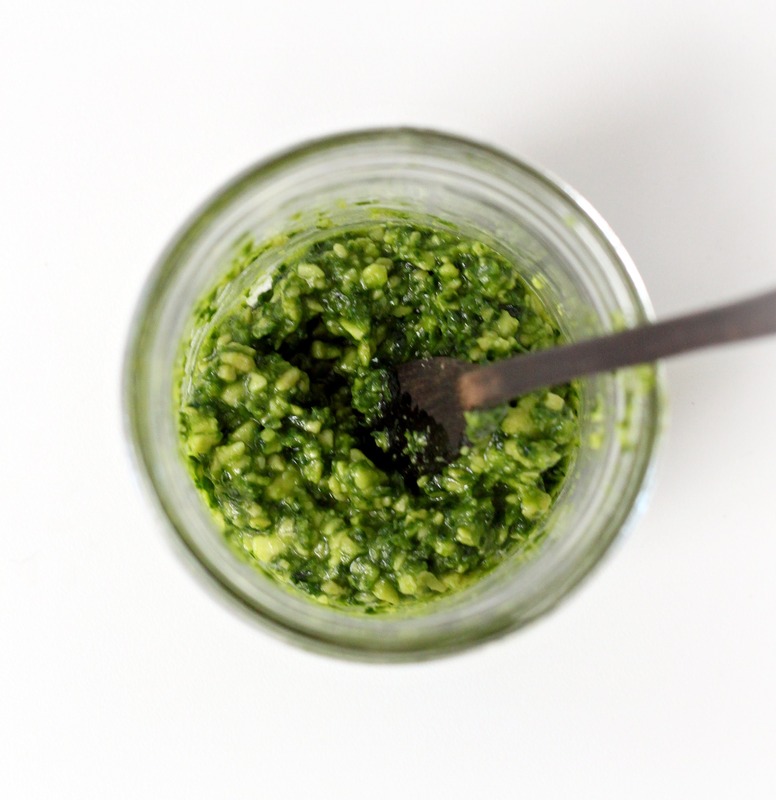 I thought I was the only anti-basil pesto fan – thanks for some great substitutions. Oh how I love the vibrant green from the spinach! A wonderful spring pesto! This looks so yummy! Thank you for sharing. I love anything pesto, including basil, but like you love to experiment with other ingredients. I’ve done kale and arugula, and now you’ve motivated me to make this with spinach! Great idea! I agree with you about trying other herbs and greens in pesto. Your version does sound good. I, of course, have made pesto with basil, but have also tried cilantro and arugula. Never spinach though for some reason….love the sound of it though and will be making some soon. I use arugula in my pesto so this is right up my alley. Delicious.